Pagan, the most important historical site in Burma, lies within a major bend of the Irrawaddy River where its east-west course turns and flows south. This capitol city, constructed entirely on the left bank of the river, is in the most arid part of the dry zone of Central Burma. Founded at sometime before the 9th century AD, Pagan was the capitol of the first Burmese kingdom from the 11th-14th centuries after its first great ruler, King Anawrahta, politically consolidated all of central Burma by conquering both the Pyu and the Mon peoples. Art and Architecture flourished during the Pagan Period and classic models were established that were copied by later kingdoms. Today, the archaeological site consists of 2,230 buildings and mounds scattered over approximately twenty-five square miles of the Pagan plain. A general pattern in the displacement of these structures is that the earlier buildings were built nearer the riverbank while later buildings are found at a distance. Among these structures are 911 temples, of which 347 have conserved to some extent their mural paintings; 524 stupas; 415 monasteries; 31 other structures including image houses, libraries and ordination halls; and numerous unexcavated mounds produced by collapsed structures. All were constructed for religious purposes except for the “city” wall. This wall was probably built to protect one of the original cites at this site. However, by the Pagan Period, this small-enclosed area had become a royal enclave with most of the city’s structures and inhabitants situated outside the wall. Although the origins of Pagan go back to before the 9th century, King Anawratha (1044-1077 AD) was its first historical ruler. He was the first to conquer the entire dry zone in the middle of the country and he was the first to establish a single center from which to administer the kingdom. It is important that he and subsequent Kings continued to develop and expand outlying irrigation systems because rice became not only a staple in the Burmese diet but also the currency of the realm in which taxes were often paid. Theravada Buddhism became the state religion of Pagan as a consequence of King Anawratha’s successful conquest to obtain Buddhist texts from the Mon state of Thaton. However, there is evidence that other types of Buddhism as well as Hinduism and Animism were practiced at Pagan. During his reign the arts and especially architecture began to flourish. His greatest accomplishments in architecture were the five stupas he built to delimit the area of the capital city. These were arranged to approximate the shape of a square mandala. Four stupas were built at its four corners, including to the north, the most famous stupa at Pagan, the Shwezigon. A fifth, the Shwesandaw, was built at the city’s symbolic center. No temples can definitely be traced to his patronage. Most of the major monuments at Pagan were built in the century following the death of King Anawratha, particularly during the reigns of his son(?) King Kyanzittha (1084-1112) and King Narapatizithu (1170-1211). In fact so many temples were constructed that the 12th century is known as the Golden Age of Burmese Temple Building. The prototypic forms for both the Burmese stupa and the Burmese temple date to this time, although in later periods the stupa instead of the temple becomes the preferred building type. Also in the 12th century Pagan became an international center for Buddhist learning. During the early Pagan Period, the ideology of the country became more thoroughly Theravada Buddhist when the major Animist spirits were subordinated to Buddhism through the creation of a hieratic arrangement that placed a Buddhist deity above the local spirits. Sakka, known as Thagyamin in Burma, is thought to be a reincarnation of the Hindu God, Indra, who presides over Tavatimsa Heaven as King of the thirty-three Gods. In Buddhist belief, Sakka - Thagyamin has become the guardian-protector of the Buddhist faith after Gautama’s Buddha’s death and thus, in his absence. In Burma, it was Sakka - Thagyamin who was appointed head of the official Pantheon of 36 local Nats who were then ranked below him. Burma became more culturally cohesive under King Anawratha’s second successor, King Kyanzittha, who was also an ardent Buddhist.. Kyanzittha was a builder of impressive temples such as the Nagayon, the Abeyadana, and the Ananda - one of the few temples to remain in constant use since it was created and the object of national pilgrimage. With in the brick walls of Pagan, he also built a fabulous palace that he had described in great detail in a lengthy inscription. The third great king Narapatisithu, constructed three great temples including the Dhamma-yazika stupa, one of the largest pentagonal buildings in the world. During the thirteenth century enormous sums continued to be spent on religious foundations and their upkeep, although the structures themselves were often more modest in scale. This practice undermined the economy and weakened the power of the monarchy since all lands and wealth given to the clergy was beyond the taxation and control of the King. In 1274, King Narapatisithu constructed the last great building at Pagan, the enormous and beautifully proportioned Mingalazedi Stupa. In 1287,when the Mongols appeared on the Northern horizon and threatened to invade Pagan, King Narathihapati fled the capital and the kingdom fragmented. The political unity of Burma was thus destroyed and was not regained until the 17th century, although Pagan continued its role as an important religious center even when later capitals were located elsewhere. The city of Pagan unlike the Pyu cities does not have an outer perimeter wall. 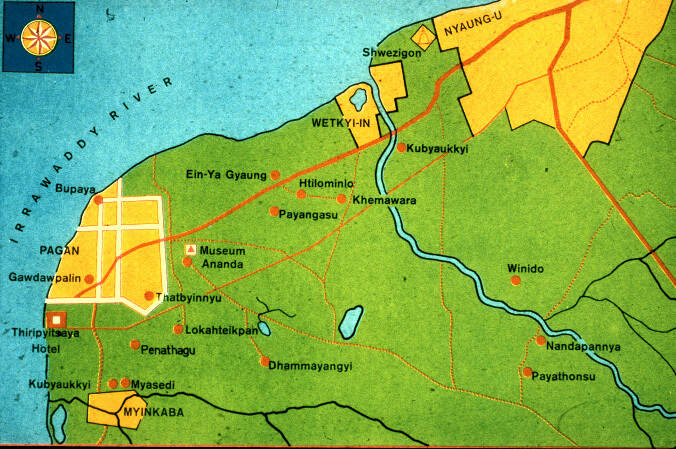 Instead, there is a walled compound located in the very bend of the Irrawaddy that by its small size corresponds to the palace compounds of the earlier Pyu sites. Side view of Tharaba Gate showing considerable thickness of the wall. Nat shrines can be seen to the left. This walled royal enclosure measures less than a square mile and occupies the Northwest corner of a twenty-five square mile area over which are scattered more than 2,000 religious buildings and structures. Within this walled area were situated the royal palace, court buildings, and a few religious monuments. Kyanzittha’s royal palace was near the center of the rectangular enclosure, beside the Thatbyinnyu, the tallest monument at Pagan and, just inside the city wall from the king’s most famous temple, the Ananda. The form of the royal compound roughly approximates a square Mandala. However, over time the river has completely washed away the western wall. Within the remaining walls, two major streets can be traced that originally connected the four major gates. A large undated stupa is located at its center where these streets cross. Recent excavations have shown that the wall was built in several phases and included massive gates, guardrooms and hidden passages – all of which were encircled by a moat. Of the city entrances identified, only the Eastern gate, the Tharaba Gate, is in a fair state of preservation. Here on either side of the entrance are found nat shrines, probably added by King Kyanzittha, to honor the brother-sister heads of the Pantheon of the 36 Nats. These two Nats in particular are thought to live on Mount Popa, a volcanic cone that can be seen - on a clear day -some thirty miles east- southeast of the gate.